This letter arrived in the mail. It’s going back Return To Sender. But note the rather ominous text on the envelope. The green envelop is a little too friendly for it to be anything too scary. Oops my browser slipped and I know what it’s for. It’s is something that most Australian’s ignore. Mostly because it’s all bad news since the GFC. Almost looks like BP’s color scheme? It’s a green envelope so I assume it has something to do with the environment or money. A charity? Is it an appeal for cash for homelessness or something similar? Insurance? no – ignoring it WILL make it go away. I think I agree with Michael – a charity. Your colon cancer test kit ? I gave up and googled. 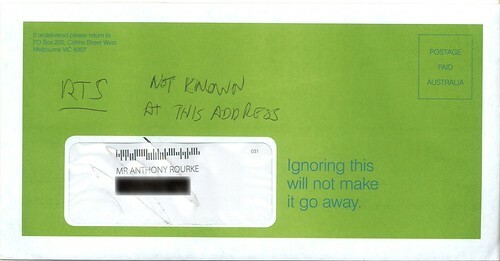 A bit of dissonance between the image of the organisation and the envelope. Obviously some marketing at play here. P.S. Don’t forget Gruen Nation tonight. @OzSoapBox, green can mean anything! It’s the cool and hip corporate colour of the 21st century! …it appears PO Box 220 is CARE Super. Too late, but I was going to say bowel cancer test kit. The fuzz growing on the vegemite. Your new tax reporting responsibility.